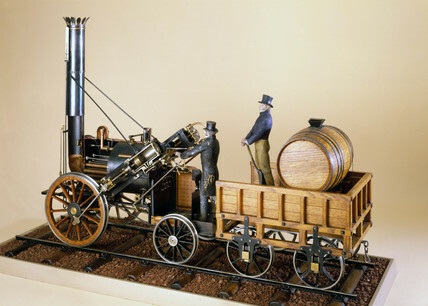 The locomotive represented by this model (scale 1:8) was designed and built by Robert Stephenson (1803- 1859) and George Stephenson (1781-1848). It became famous after winning the Rainhill Trials, a competition designed to find the most efficient locomotive for haulage on the Liverpool and Manchester Railway. This version three model shows the Rocket model in its present state with the firebox rebuilt and altered boiler details. This is believed to be how the Rocket appeared at the Rainhill Trials in 1829.